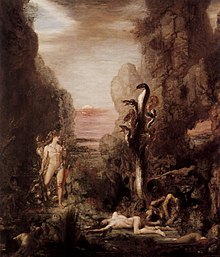 Gustave Moreau (6 April 1826 – 18 April 1898) was a French Symbolist painter, famous for his illustration of biblical and mythological figures. I have never looked for dream in reality or reality in dream. I have allowed my imagination free play, and I have not been led astray by it. I believe neither in what I touch nor what I see. I only believe in what I do not see, and solely in what I feel. Sleep, though sad] is gentler than tears which, though painful, are gentler than death. I am dominated by one thing, an irresistible, burning attraction towards the abstract. The expression of human feelings and the passions of man certainly interest me deeply, but I am less concerned with expressing the motions of the soul and mind than to render visible, so to speak, the inner flashes of intuition which have something divine in their apparent insignificance and reveal magic, even divine horizons, when they are transposed into the marvellous effects of pure plastic art. I have designed a decorative and monumental work as a group of subjects representing the three ages of sacred and profane mythology: the Golden Age, the Silver Age and the Iron Age. I have symbolised these different ages by dividing each one into compositions representing the three phases of the day: morning, noon and evening. 2. A walk in Paradise or the ecstasy before nature. 1. The dream nature is revealed to the senses of the inspired poet. 3. Orpheus in the forest, his lyre broken and he longs for unknown countries and immortality. 1. The Sower making the earth productive (production). 3. Death (Cain and Abel). The grievous sufferings and death of mature age: Cain with the redemption of Christ. D— thought it was an extremely ingenious and intelligent device to have used a figure from pagan antiquity for the cycle of youth and poetry instead of a Biblical figure, because intelligence and poetry are far better personified in these periods which were devoted to art and the imagination than in the Bible which is all sentiment and religiosity. The Iron Age. Decadence and fall of humanity. I shall represent Cain ploughing and Abel sowing. Noon: Cain rests while Abel tends the altar of the Lord from which smoke, a symbol of purity, rises straight to the heavens. The evening: death at the hands of Cain. The first death corresponds to the other deaths in the two other paintings: sleep and death of the senses; tears and the death of the heart. Do you understand the progression? Sleep, though sad, is gentler than tears which, though painful, are gentler than death. Ecstasy is more delightful than song, which is gentler than work. Prayer is superior to dreaming which is more elevated than manual work. One would have to coin a word for the occasion if one wished to characterise the talent of Gustave Moreau, the word colourism for example, which would well convey all that is excessive, superb and prodigious in his love for colour.. .It is as if one were in the presence of an illuminator who had been a jeweler before becoming a painter and who, having yielded to the intoxication of colour, had ground rubies, sapphires, emeralds, topazes, opals, pearls and mother of pearl to make up his palette. 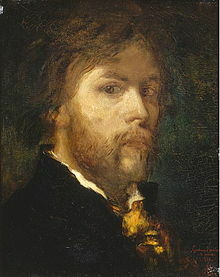 ..that distinguished aesthete [Gustave Moreau] who paints nothing than rubbish, it is because his dreams are suggested not by the inspiration of Nature, but by what he has seen in the museums.. ..I should like to have that good man under my wing, to point out to him the doctrine of a development of art by contact with Nature. It's so sane, so comforting, the only just conception of art. He didn't set his pupils on the right road, he took them off it. He made them uneasy.. .He didn't show us how to paint; he roused our imagination. Moreau's figures are ambiguous; it is hardly possible to distinguish at the first glance which of two lovers is the man, which the woman; all his characters are linked by subtle bonds of relationship.. ..lovers look as though they were related, brothers as though they were lovers, men have the faces of virgins, virgins the faces of youths; the symbols of Good and Evil are entwined and equivocally confused. My discovery, at the age of sixteen, of the Gustave Moreau museum influenced forever my idea of love... Beauty and love were first revealed to me there through the medium of a few faces, the poses of a few women. He believed that, in order to produce art that signifies at the exalted level he envisaged, the painter must develop the "eyes of the soul and spirit as well as the body." Moreau associated this inner vision with the predominant role of the imagination; following current ideas, he apparently connected this faculty with "psychological penetration" and the unconscious.... Moreau wrote that his "greatest effort" was devoted to directing his imaginative energies, to channeling "this outpouring of oneself."